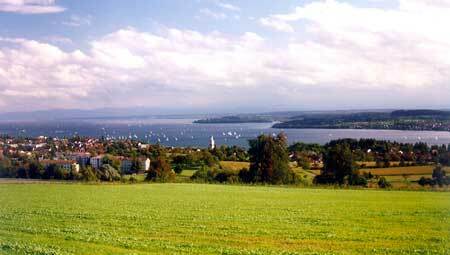 Arriving on the B 31, take the exit "Überlingen West/Aufkirch" in the direction of "Stadtmitte". on the left and a clothing shop "Munding", turn left into a small alleyway called "Pfarrhofgasse"
fountain on the small square called "Pflummernplatz" where you can stop to unload your luggage. We have limited car parks available at an additonal € 6.- per night . Within 5 minutes´ walk there are 2 parking buildings with daily (€ 10.-) and weekly (€ 45.-) rates. and also some car parks free of charge at weekends and holidays. Follow the cycle track around Lake Constance ("Bodenseeradweg") into the centre of town. into an alleyway called "Schulstrasse" which leads you to a small square called "Pflummernplatz". 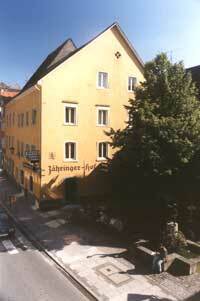 Our hotel Zähringer Hof is on your right next to the lime tree and fountain. There is a lockable bicycle room in our backyard. -   Take the town bus to "Landungsplatz" from the bus station (right next to the train station). small square at the bottom of "Geradebergstr." left next to the lime tree and fountain on the small square called "Pflummernplatz". "Singen" and get off at "Überlingen" station (below ground level). From there walk past the tourist information office and the big square with a fountain on your left. called "Pflummernplatz". Our hotel Zähringer Hof is next to the lime tree and fountain on your right. the small square called "Pflummernplatz" at the bottom of this street. the small square called "Pflummernplatz".